Ransomware is a malicious software which is also known as ransom-malware that threatens to delete or deny access to data, once it takes control over a computing device. The cybercriminal who initiated the attack commands ransom to be paid through cryptocurrency or credit card in order to recover the access to the files or the computing device itself. Today, ransomware attacks are becoming very common and enterprise data has become more exposed to online fraudsters. This necessitates the need to protect all the computing devices in the network with the help of advanced virus protection software to evade all types of malware and ransomware attacks. This article here explains in full about ransomware, its origins, types and how to equip the reader with better knowledge to steer clear out of all types of ransom attacks. Let’s get started from the evolution stage of Ransomware to better understand! The first ransom attack was basic and opinions of experts point out that it was full of flaws. However, this did pave the way for the evolution of ransomware to be one of the most complex attacks carried out today. According to an article in Fast Company, the first developers of ransomware wrote their own encryption code. A quick forward to the present ransomware developers are more relying on “off-the-shelf libraries that are significantly harder to crack,” and they’re also leveraging numerous advanced methods of delivery, like spear-phishing campaigns rather than the conventional phishing email blasts, which are usually filtered out by email spam filters these days. Additionally, a few complex attackers are involved in the process of producing toolkits that can simply be downloaded and deployed by attackers with less technical skills. Some of the most sophisticated hackers are monetizing ransomware by giving ransomware-as-a-service programs, which has led to the rise in influence of well-known ransomware like CryptoWall, Locky, TeslaCrypt, and CryptoLocker. Noticeably, the CryptoWall ransomware solely had generated more than $320 million in revenue. It was in the year 1989, the first documented ransomware attack happened but ransomware attacks remained rare until the mid-2000s. It was from the mid of the 2000s when the attacks started utilizing more advanced and tougher-to-crack encryption algorithms such as RSA encryption. Some of the most popular during this time were Gpcode, TROJ.RANSOM.A, Gpcode, Archiveus, Cryzip, MayArchive, and Krotten. In the year 2011, a ransomware worm that copied the Windows Product Activation notice appeared on the scene, making it more difficult for users to interpret genuine information from threats. Ever since 2005, Ransomware has maintained prominence as one of the biggest threats. since 2005, the first ransomware attacks occurred much earlier. The first recorded ransomware attack occurred in 1989 and targeted the healthcare industry, according to Becker’s hospital review. A fast forward to the present, the healthcare industry remains a top target for ransomware attacks. The first ransomware attack was named as the PC Cyborg or the AIDS Trojan which was initiated by Joseph Popp, Ph.D., an AIDS researcher in the year 1989. He spread the virus by giving 20,000 floppy disks to AIDS researchers spanning more than 90 countries. He claimed that the floppy disks comprised of a program that investigated an individual’s risk of getting AIDS through the use of a survey. But, the disk concealed within a malware program that originally played dormant in computers, only activating after a computer was powered on 90 times. After the 90-start, the malware showed a message necessitating a payment of $189 and $378 for a software lease. Scareware is a type of ransomware – malware which is created with the intention to trick victims into buying and downloading useless and potentially vulnerable software. In other words, the Scareware comes bundled with rogue security software and tech support scams. Usually, the computer user is prompted with a pop-up message saying that malware was found and the only way to get rid of it is to pay up. When the user doesn’t react to the threating message, the computer likely to bombarded with pop-ups, however, the files saved in the computer are actually safe. When a powerful antivirus protection program is in place then it is easy to monitor such ransomware attacks. A robust security software guarding the PC will help ward off such online dangers. Like the name interprets, a lock-screen ransomware halts all the PC activities altogether once it gets inside. When the computer user turns ON, a full-size window appears usually accompanied by an official-looking FBI or US Department of Justice seal. The displayed message reads that an illegal activity has been identified on the PC and the user is required to pay the fine to restore the normal actions. For people who are unaware of the fact that the FBI does not freeze the user out of their computer or make demands for any money will not understand it is a ransomware attack. When such unanticipated things occur, it is wise to take an experts supervision to resolve the issue. To skip all such nuisance install a robust antivirus program today. By using Encrypting Ransomware a hacker locks all the files and encrypts them on a computing device. Once it is successfully accomplished, the cybercriminal later demands the ransom for decrypting and redelivering to the user. The Encrypting Ransomware is considered dangerous as not many security programs are competent enough to tackle the attack. Besides, paying the ransom doesn’t mean there is a surety that the hacker will give back the access to all the locked files. The ransomware can infect your computer in numerous ways. A few to name are malspam or malicious spam, which is an unsolicited email that is used to deliver malicious software. The email might arrive as PDFs or Word documents which are actually booby-trapped attachments. Sometimes links to malware delivering websites are also provided in this emails. With the help of social engineering malicious spam deceives people into opening attachments or clicking on links by appearing as legitimate. Most of the time, it seems to arrive from a trusted friend or a popular institution which is hard to raise the doubt for the beholder. The social engineering techniques also provide an upper hand by posing as the FBI in order to scare users into paying them a sum of money to unlock their files. Malvertising or malicious advertising is yet another popular infection method, which reached its peak in 2016. The online advertising was used to distribute malware with little to no user interaction required. Who Does Ransomware Attacks Target? The recent global ransomware attacks on critical infrastructures prove cybercriminals are continually evolving their hacking techniques. Hackers made use of sophisticated techniques to successfully stage the WannaCry and ExPetya ransomware attacks in 2017. Both the attacks sabotaged the computers and erased all important data. And still, many of us are not fully aware of the hi-tech cyber-attacks. Acronis conducted a worldwide survey to understand the awareness of ransomware attacks and the preparedness to safeguard data. The results pointed out that every minute six users become victims of zero-day attacks and thirty-four percentage of worldwide participants were willing to pay a ransom once attacked. As per the recent Gartner findings, the global damages from ransomware attacks will reach $11.5 billion by 2019 and the same was supported by Acronis findings. Even though the news about the ransomware attacks and zero-day vulnerability is widespread, nearly half of the technical crowd seem to be unaware of such online threats. In early 2018, Acronis identified twenty ransomware that can potentially pose a serious security threat to big organizations. Hackers will target mobile devices, wearables and IoT devices which are critical for many users. People who are unprepared will be victimized. Since the WannaCry and ExPetya attacks, big organizations have secured their online premises with numerous security protocols. However, several ransomware and zero-day vulnerabilities still exist and no patches are available to prevent hackers from exploiting it. In 2018, Artificial Intelligence (AI) will help hackers in detecting the weak spots to penetrate through the security protocols. On the other hand, Artificial Intelligence (AI) will also benefit Enterprises to detect zero-day vulnerabilities which could provide an opportunity for the hacker to exploit. Update to fix such issues or patches will be instantaneously worked on by security experts. Cybercriminals will target IoT devices and computers. This time, they will go for the backup and try destroying it because that’s the only thing that helps you retrieve data after ransomware attacks. In order to stay protected, you need to prevent hackers from reaching your backup files. Here are a few things that you can do to prevent such attacks: firstly, always install updates. Secondly, always run backups on time. Besides that, stay cautious when surfing the internet. Avoid downloading files from shady sources and opening email attachments from suspicious email addresses. Comodo Antivirus software is free which is available for both commercial and personal use. It incorporates all other security features which are required to safeguard your PC from numerous online threats. For more details visit our official Comodo Antivirus page. The Comodo Internet Security is one of the few effective free antivirus software that you can trust on. It does an amazing job of detecting threats as and when they occur on your computer. Likewise, it is quick enough to eliminate and secure your system back to shape. 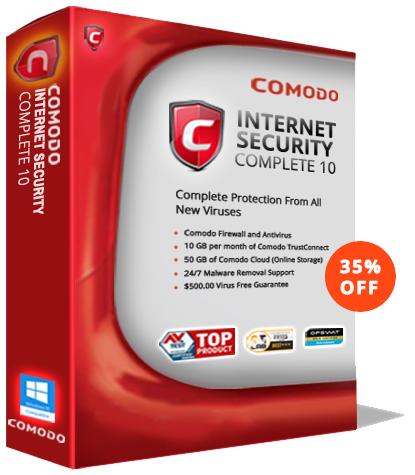 The Comodo Internet security antivirus can simply be downloaded on your computer hassle-free. However, be sure to read all the instructions carefully during the installation process to understand the software thoroughly. The Comodo Internet Security includes firewall, antivirus, a tricked-out browser, sandboxing, secure shopping, and more. You get more out of the free anti-virus software without paying a single penny. Even before get started to download the anti-virus software check for these system requirements. It is downloadable on Windows 10, Windows 8, Windows 7 / Vista / XP SP2 32-bit and requires 64-bit 152 MB RAM and 400 MB hard disk space respectively to guarantee smooth functioning on your PC. The latest Comodo Internet Security Premium 10 has come up with a clear and organized user interface for its users. The home screen is customizable and offers the advanced view to its users. The addition of manage protection enables the user to turn ON/OFF, the individual components very quickly which includes first scope tips and website filtering and these features make it a very handy edition. The default-Deny protection is an exceptional line of defense in a multilevel defense strategy. This feature impressively reduces the possibility of malware infection and avoids the high costs of such compromises. It is a combination of firewall, behavior analysis, host intrusion prevention and Auto-Sandboxing that helps in filtering safe and unsafe files to decrease the chance of any harm coming to your computer. The prevention-based protection is used to prevent harmful files from entering the system at the initial stage. This approach effectively denies malware attacks by default. The Comodo antivirus program automatically denies access to the system if it is an unknown file. Users can safely run a suspicious file to verify the authenticity before the verdict is passed. This is called as containerization. The customized protection alerts equip a user to customize the rules to download a software. Based on the inputs provided by the user, the firewall instantaneously adapts to adjusts its alerts accordingly to fit the fill of the user’s needs. The Virtual Desktop feature is another important feature which has the ability to virtualize an operating system. With the help of this feature, the user can create a safe play zone for children and other users. The Comodo antivirus software features multi-layered security, user-friendly interface, file scanning system and much more. With Comodo, you can safeguard your endpoints effectively and stay protected from the emerging threats.